The global bioceramic market was estimated to be valued at USD 2,591.43 million in 2017, and is expected to register a CAGR of 10.07% during the forecast period of 2018-2023. The orthopedic segment dominated the global bioceramic market, with about 41.53% share of the global market, whereas, the bio-medical segment is estimated to register the fastest CAGR through the forecast period. Bioceramics have various properties, such as high biocompatibility, wear resistance, and thrombo resistance, which make them highly suitable for medical applications, like bone implants. Joint replacements are commonly coated with bioceramic materials, to reduce wear and inflammatory response. The global bioceramic market is dominated by the orthopedic segment. However, the orthopedic segment is expected to register the slowest growth over the forecast period, at a CAGR of 9.93%. The orthopedic sector is expected to witness significant growth, due to increasing surgical intervention trend for shoulder, knee, and hip implants, at an early stage. The growing aging population has led to a rising incidence of osteoarthritis, which is expected to increase the consumption of bioceramics for knee and hip joint replacements and implants. Owing to its optimistic outlook toward the orthopedic sector, primarily in Germany, Europe is the largest market for bioceramics. Additionally, the hip and knee replacement sector is expected to grow in the United States. This can be attributed to the rising demand for joint designs with specific measurements of a patient, coupled with customer awareness about the various options available for replacements. Europe accounted for the highest share of about 43% of the global market, in 2017. The European segment is mainly driven by the demand for dental applications in Germany, United Kingdom, Italy, and France. 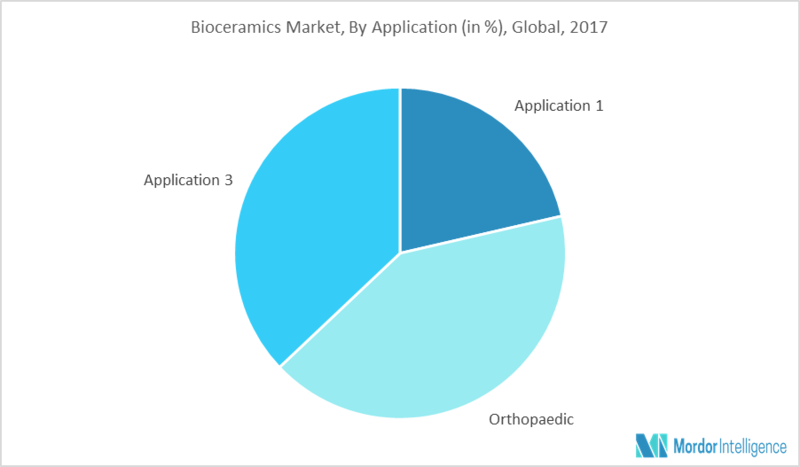 An aging population and the increasing prevalence of lifestyle-related chronic diseases are expected to boost the demand for healthcare in the region, which further boosts the regional bioceramics market. North America is the fastest growing region for bioceramics and portrays huge potential for growth in the future owing to the increasing health care spending. Germany is the largest global consumer of bioceramics. The country holds approximately 17% share in the global bioceramics consumption. The growing demand from the healthcare sector, especially from the dental and orthopedic segments, is estimated to propel the demand for bioceramics in Germany. March 2017: CeramTec announced that it has newly developed a dental ceramic, Zirconium Oxide Bright. March 2017: Bonesupport extended its United States Distribution Agreement for CERAMENT™, bone void filler. January 2017: Amedica announced the successful completion of the first Taurus™ pedicle screw system surgery. Major Players: CoorsTek Inc., Kyocera Corp., CeramTec, Morgan Advanced Materials, and Nobel Biocare, amongst others. Regions or countries that are expected to witness the fastest growth during the forecast period. 9.2 Berkeley Advanced Biomaterials, Inc.